Extensive tooth loss can make every aspect of your daily life a little more difficult. From eating all of your favorite foods to sharing a smile with a friend, dealing with the gaps in your smile is a struggle. Your dentist in Weatherford, Thomas J. Novack, DDS, is here to help you fully restore your smile. 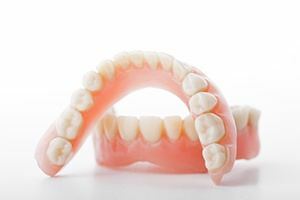 We offer a variety of advanced tooth replacement options, including partial and full dentures. Don’t struggle with an incomplete smile for even one more day. Instead, call Dr. Novack at his dental office in Weatherford to schedule your tooth replacement consultation. Our dentist and team will review your tooth replacement options and help you to find the best treatment to recreate your lost tooth structures and put the smile back on your face. Partial dentures are used to fill in gaps in the smile following the loss of several consecutive and/or nonconsecutive missing teeth. Sometimes simply referred to as partials, these tooth replacement prosthetics fit into the smile snapping in place like a puzzle piece. Partials use a gum-colored base to support all of the replacement teeth within the same restoration. Then, the partial denture is anchored in place by clasps that connect to surrounding healthy teeth. Like partials, these tooth replacement prosthetics are crafted using a gum-colored base material to support all of the replacement teeth. 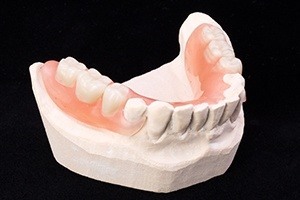 Because there aren’t remaining teeth to provide support for the denture, we need to craft the base to sit against the gums, which creates suction that holds your denture in place. Some patients also use a small amount of denture adhesive to improve the stability of their denture. Don’t plan to wear your denture for a full 8 hours or longer right away. Wear your denture for a few hours at a time and give yourself breaks to avoid bruising or irritating soft tissue. Try saying tongue twisters and singing with your denture in place. 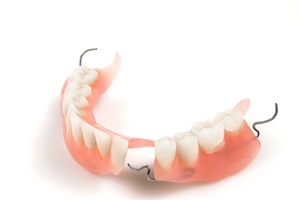 This can help you get used to how the denture will feel as you speak and smile. Don’t start off with a steak dinner and an apple for dessert. Eat softer foods with your denture to get used to the way they feel. Then, introduce tougher to chew foods as you’re comfortable. If you want to explore a denture option that offers improved stability and longevity, you may want to ask about dental implant supported tooth replacement options. Dental implant posts are inserted into the gum line where they mimic the lost tooth roots, supporting your partial or full denture just like the healthy root structure would. Traditional bridges can replace about 20% of your chewing function, but an implant-retained denture returns 70% or more, allowing you to eat a wider range of foods. 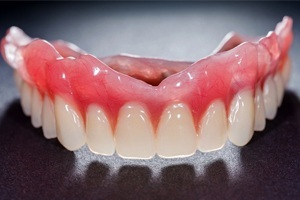 Implant dentures also have a 90% or greater success rate after 20 years compared with traditional dentures that need to be replaced very ten years on average. Choosing the right treatment to replace your missing teeth is a big decision and investment. Dr. Novak and Dr. Johannsen understand you have plenty of questions about dentures in Weatherford. They take the time to discuss your treatment options and answer your questions during your consultation to help you make an educated choice for your oral health and your quality of life. In the meantime, here are the answers to leading questions about partials and dentures to help you start your journey to a complete smile. You have probably heard dentures are painful, but new advancements in dentistry now make them more comfortable than ever. Advanced impression methods and new materials allow them to offer a secure fit to minimize any slipping or irritation. If you are new to dentures or recently had a tooth extracted, it is normal to experience some slight discomfort, but it will subside within a few days. If the pain does not go away or develops after you have had your dentures for a while, it is best to contact your restorative dentist in Weatherford to find a solution to the problem. Replacing your missing teeth reduces the need to limit your diet. You will need to cut your foods into smaller pieces, but you should be able to eat your favorite foods again. If you have difficulty chewing certain foods, like steak, consider asking Dr. Novak about adding the security of dental implants to your denture. This can restore are much as 70% of your biting force. How Can I Prevent Odors? You may have heard dentures can smell. While this is true, it is not due to the denture itself. Instead, it is a result of odor-causing bacteria from poor cleaning habits. Although your dentures are not subject to tooth decay, you must take the time to clean them daily. Use a soft-bristled toothbrush and nonabrasive toothpaste to remove bacteria and food particles. Do not forget to brush any remaining natural teeth, your gums, and your tongue to remove harmful and smelly bacteria from your mouth. Besides brushing, it is best to soak your denture at night in a solution specifically made for the dental prosthetic. This helps to sanitize them while also reducing the occurrence of staining. There is no way to give you a cost for your new smile without first scheduling a consultation. There are various factors that influence the price of dentures, such as if you need additional procedures, the number of teeth you are replacing, and the type of denture you need. 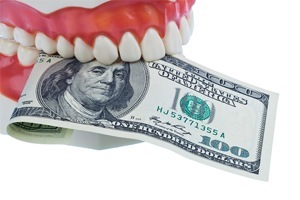 Often, you can use your dental insurance to lower the amount you need to pay. We discuss your treatment process and the amount you can expect to pay. We help keep your new smile affordable by maximizing your dental insurance and accepting a variety of payment options, like CareCredit. If you still have questions about partials or dentures, do not hesitate to contact our office to schedule an appointment. We will help you choose the right treatment for your smile.